Come meet, hear, and question all three Democratic challengers to Congressman Darrell Issa: Doug Applegate, Mike Levin, and Paul Kerr. Join in the expanded Q&A. The 49th District race promises to be one of the most watched of 2018, drawing massive amounts of national press attention and campaign money. A swing district, right in our backyards! Get involved early. Come early and stay late for maximum contact with our featured speakers. WHEN: Thursday September 14 at 6:30 PM. Program begins at 7:00. COST: $15 for Democratic club members. $25 for others. Join the RSFD Club for $50 and get the $15 rate and member discounts. RSVP: CLICK HERE TO RSVP and PAY. To RSVP by phone call VICKIE at (858) 735-6404 or MARIA at (858) 759-2620. Our monthly programs are our Club’s signature and our brand, our most important shared activity, our main reason for getting together. This Club seeks to be a platform for the political activism of our members. Apart from compelling speakers, panelists, and topics for our programs, our Club is committed to (1) A regular meeting date and venue, usually second Thursdays at the Lomas Santa Fe Country Club; (2) Compact programs under 90 minutes long, with socializing before and after; and (3) More than one-third of program time always reserved for Q&A to maximize discussion. Our programs are structured to provide maximum opportunity for our members and guests to meet and to question elected officials and political candidates and to socialize with fellow Democrats. The keynote speaker or panel is not the whole show. Registration and socializing begin at 6:30. Democratic candidates for elected office often are part of the mix. The program begins at 7:00 with announcements, introductions, and brief speeches. The program ends by 8:30. The time after the formal program provides further opportunity to question our guest speakers and to visit with fellow Democrats. Over 100 of us heard heard from New County Chair, Jessica Hayes, and Former Chair, Francine Busby. We also honored and bid a fond farewell to Dave Roberts, who is moving to Connecticut. We met with and asked question of recently elected San Diego Councilmembers Barbara Bry and Chris Ward and City Attorney Mara Elliott. Barbara represents San Diego council District 1 where many of our club members live and vote. Barbara ran so strongly in the June primary that her Republican opponent dropped out. Chris previously served as chief of staff for my old friend former Senator Marty Block. Chris won his council election in the primary. Unlike Barbara and Chris, Mara faces a citywide vote to be re-elected in 2020. One regional survey found Mara to be the “most progressive” of all San Diego-area candidates and elected officials in 2016. We are asking all our featured speakers to include comments on what Democrats should do in response to the Trump presidency. Members met with recently elected legislative representatives, state Senator Toni Atkins and Assemblyman Todd Gloria. Most RSFD Club members live and vote in their districts. Toni Atkins has served with distinction on the San Diego City Council and in the state Assembly where she rose to be Speaker, the first from San Diego and the first LGBT Speaker. Todd Gloria has served on the San Diego City Council and as the interim mayor of San Diego – a promising young Democrat. what Democrats should do in response to the Trump presidency. This meeting was built around small group discussions in which members and guests participated in outlining goals and actions to combat the Trump agenda. Thanks to all who attended our wonderful reception with Governor Michael Dukakis on February 4th! Due to popular request, we are posting the remarks made by RSF Democratic Club president Michael Gelfand, delivered at the event. Enjoy! Michael Gelfand Speaking Prior to The Introduction of Michael Dukakis. The inmates have taken over the asylum. The criminals have become the police. The most honorable have become the depraved. It's like we are living in an alternate universe. Any way you slice it, the Trump presidency is a fundamental test of our democratic system. The alternate universe he's created begins with him normalizing lying and intentional deception… He's made his people not care that his sense of Truth is exclusively whatever his conman mind finds expedient. He has subverted The Free Press, the foundation of our democracy by delivering his spin directly to the public, bypassing the scrutiny of the press. 84 years ago Adolph Hitler subverted the press. He also suspended civil liberties, and created a mythology surrounding his rise to power. His nationalistic, isolationist propaganda infected Germany, and his threats to the disloyal entrenched a culture of fear. Trump is using Hitler's playbook. Trump is cutting senior military and intelligence staff out of security meetings, and setting up his own intelligence and security forces. He has already fired most of the senior staff at the State Department. He's completely stopped the forward progress of the EPA and muzzled their employees. He's scapegoated Muslims, Mexicans, Planned Parenthood, and put anyone that speaks against him on notice that they're next. It's hard not to be concerned that Trump is enacting a coup, not unlike Hitler's takeover of Germany. • When Trump’s travel ban clearly confirms that he is anti-Muslim and pro-Christian, thus exacerbating international terrorism rather than eliminating it. • I don’t think we are overreacting if we think Trump is a fascist. • I don’t think we are overreacting if we think he and his Attorney General are racists. • I don’t think we are overreacting if we think he is a misogynist that will dilute women's rights. • I don’t think we are overreacting if we think he will sacrifice the environment for greed. • I don’t think we are overreacting if we think he will replace public schools with charter schools that teach creationism instead of science. • I don’t think we are overreacting if we think that his wall is a total waste of money that will alienate an ally, and that his tariffs will cause a trade war. • I don’t think we are overreacting when his Secretary of State is the poster child for income disparity and corporate personhood, when the architects of his economic strategy are now some of the same people he denounced in his campaign, and when his first economic proposals would dilute consumer investment protections. • I don’t think we are overreacting when his conflicts of interest are HUGE beyond comprehension, and his presidency is a colossal scheme to further enrich himself and his offspring. • I don’t think we are overreacting when his bluster toward Iran and China, and his loose mouth and Twitter addiction could bring on WWIII. Is there a downside to letting Trump and our legislators know how strongly we feel? - And we should take action to protect our Constitution. Political policies become cultural architecture, and Trump is designing a bleak, hate-based world. We cannot allow him to legitimize and re-institutionalize racism, sexism, and religious prejudice. We cannot allow him to risk the earth's climate. We cannot allow him to make us hated throughout the world. We need to indivisibly take him on, over every outrageous policy decision, over every lie, over every uncompassionate act. Can we make a difference? Yes! We're lucky because Trump is so damn bad that he has crystalized a force opposed to him and his policies, the likes of which we haven't seen since the anti-war and civil rights movements in the 60's. We're lucky because we have Darrel Issa, the worst member of Congress here in the 49th, and he is vulnerable. We need to bombard him with letters, emails, picketing, marches, and most importantly phone calls. We need him to understand that his support of Trump's policies will assure his defeat in 2018. We need him and the Republican establishment to keep Trump's power in check, keep his policies from subverting the Constitution, and keep him from undoing a century of progressive accomplishments. If, here in the conservatively gerrymandered 49th congressional district, we can change Issa's votes, and even get him out of office, it can happen throughout America. I was depressed and disgusted over Trump's election… But I am beginning to feel optimism, enthusiasm, and a reinvigorated sense of patriotic duty. I hope you feel the same way. Each of us need to help save our country. The time for being on the sidelines has ended. Read the Indivisible Guide. Take action. Do it yourself, form a group, join a Democratic Club. Come to our meeting next month when we will be discussing the ways that we can all get involved. Just take action, and keep taking action until Trump and his point of view are out of the White House, and until the land of the free… is free of the depraved. A panel of top San Diego-area political experts provided post-election commentary and answered questions from the audience at the November 10 meeting of the Rancho Santa Fe Democratic Club. Jennifer Tierney is a top political consultant whose clients include Toni Atkins and Todd Gloria. Jim Ingram, who teaches political science at San Diego State University, is an authority on the politics of the San Diego region. Chris Crotty is a veteran political consultant who has worked on almost all Democratic presidential campaigns since 1984, including Hillary 2016. This was Jen’s third visit with us, Jim’s second, Chris’s first. These three are among the sharpest political minds in San Diego. National, state, and local candidates and ballot measures were discussed. With the November election less than one month away, members and non-members joined us for Beach Cities Politics featuring short speeches by city council candidates plus the opportunity to meet candidates at their tables. A very successful and fun fundraiser for Dave Roberts - Thanks to Fundraising Chair, Jamie Carr, who hosted the event, and all board members and others who helped organize and execute it! We raised over $20,000 to use to help Democratic candidates in our area get elected in October. Thanks to all who sponsored and attended the event! Thanks also to all who helped organize the event, especially committee Chair, our own Maria McEneany, pictured below (center) along with Paul McEneany and Susan Wayo. It was great fun! A panel of top San Diego-area political consultants provided post-election commentary and answer questions from the audience at the June 9 meeting of the Rancho Santa Fe Democratic Club. Tom Shepard ran four successful campaigns for mayor of San Diego. Recent clients include San Diego council candidates Barbara Bry and Chris Ward, city attorney candidate Gil Cabrera, and mayoral candidate Ed Harris. Jennifer Tierney’s clients include Assembly Speaker-Emeritus Toni Atkins and San Diego Councilman and Assembly candidate Todd Gloria. Chris Crotty has worked for candidates and initiatives, for political committees, labor unions, municipalities, and trade associations. Come hear the experts on the biggest surprises of the June 7 election, the prospects for November, and the best and worst news for Democrats. We registered voters, promoted the Democratic Party, recruited new members, and had a great time! Our first new voter registration of the weekend: Adam Harms from San Diego, ringing the "I registered" cowbell! Come meet and question local candidates for Congress, county supervisor, San Diego mayor, San Diego City Council, and San Diego city attorney. With the June primary less than one month away and with mail voting just under way please join us for a Candidates Fair featuring speeches by candidates for elective office in areas where our Club members live and vote – plus a few more strategic races. These candidates are confirmed...and more to come! Candidates will sit at tables in the audience returning to their seats after they speak to engage audience members who want to meet them after all the speeches are done. Topic: "Preventing Gun Violence: What Can We Do?" The staggering toll of lives lost in recent mass shootings leads many of us to ask how we might help reduce these senseless tragedies related to gun violence. Candidate for State Assembly - District 78. Two key area races: Attorney and retired Marine colonel Doug Applegate is the Democratic candidate for the House seat now held by Darrell Issa. Democratic environmental activist Eve Simmons is running for the Assembly seat now held by Rocky Chavez. Details to follow. WHEN: Thursday October 8, 6:30 pm. North County Democrats at the BIG BLUE BARBECUE! We will be having our annual event at the San Dieguito City Park (area #3) on Saturday, September 12 from 1:00p.m. to 6:00p.m. US Senate Candidate Kamala Harris, special fundraiser in North County. 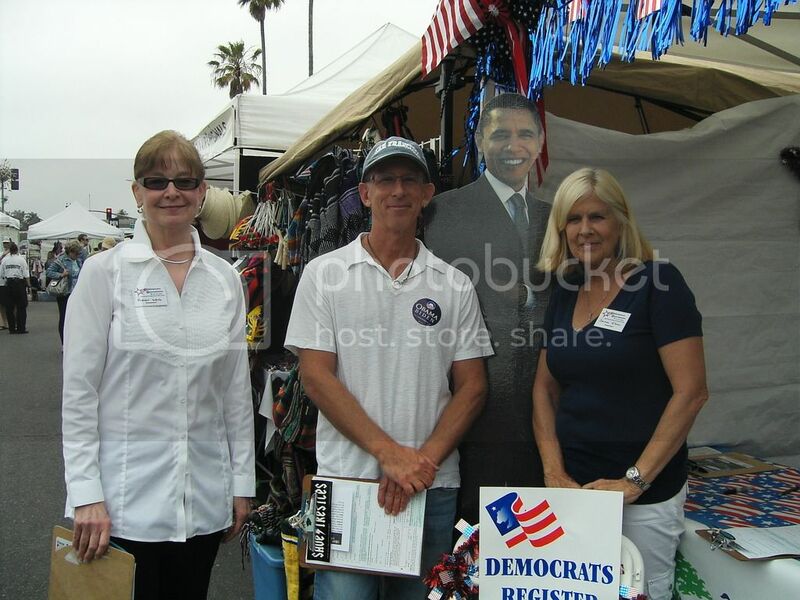 Members and friends of the Rancho Santa Fe Democratic Club will be volunteering to register voters and greet local Democrats at this year's Fiesta Del Sol celebration in Solana Beach. We would truly appreciate your help in staffing our club booth for this important (and fun!) activity! Instructions for completing voter registration forms will be provided on the day of the event. Please sign up for a one or more 3-hour blocks of time for either Saturday, May 30th, or Sunday, May 31st.